For $300 you would think you are getting an incredible deal or are you? I think all this information about this bike is too much and makes the add confusing. Someone who is going to buy $300 bike isn't going to care about this much detail about all the parts, which to be frank aren't that great. It's stock parts that came with the bike. Anyone can list the stock parts list, I would just highlight any upgrades. Maybe if the bike was being sold $3000 and all the parts were real bling, bling than all this information would be useful. Still, this would be a great entry level bike for someone wanting to get a taste of the Kewlaid without making a big commitment. For Sale 2007 GT Peace Jr 29" Single speed. This bike is in excellent condition and has a new front suspension and two rear cogs; a 20 tooth and the factory 18 tooth cog. Also there is a Tamer suspension seat post to soften the ride. I will be including the factory seat post as well as the factory fork. There is a seat bag and a couple of spare tubes that will also be sent with the bike. 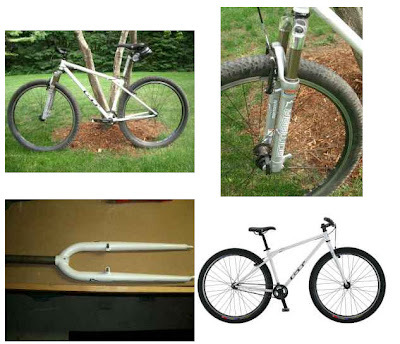 I have listed all of the components on the bike below. Please email any questions you have on the bike. • CHAIN: KMC Z610 HX 1/8"
• FRONT TIRE: WTB ExiWolf, 60tpi, 29x2.3"
• REAR TIRE:WTB ExiWolf, 60tpi, 29x2.3"
• HANDLEBAR: Truvativ XR Riser, 25mm rise, 25.4 OD.